It is an old tradition in Catholicism to make the sign of the cross when passing a Catholic church, as a sign of respect to the Eucharist contained in the tabernacle, located within the Church. Do Eastern Orthodox, Oriental Orthodox, and Church of the East also have tabernacles in their churches? If they do, is it appropriate for a Catholic to make the sign of the cross when passing these churches? It is also a tradition for some Catholics to make the sign of the cross when passing in front of cemeteries, whether a Catholic one or otherwise. Of course there would be some of the faithful departed in many of these cemeteries I imagine. Seeing that the Orthodox Church does have valid sacraments which includes the Eucharist, it would be appropriate for a Catholic to make the sign of the cross when passing in front of a Orthodox church in order to show an external sign of respect of the real presence of Jesus Christ in the consecrated host. Of course Eastern Orthodox church, like Russian, or Greek, have the tabernacles of Eucharist gifts in their churches. Orthodox christians called it as kibot (ru: Кивот, gr: κῑβωτός). It is always resided at the altar. Frequently, in modern time it has a form of mini church. 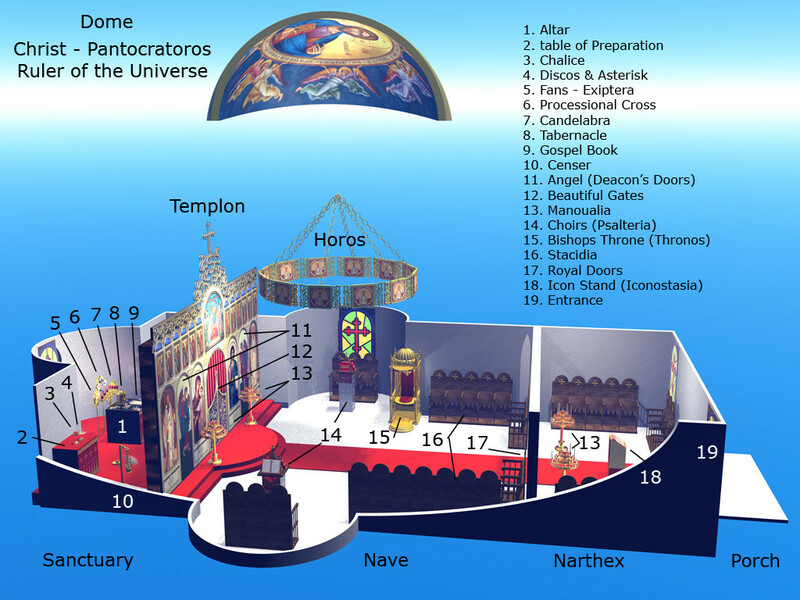 Usually tabernacles is being covered with a glass hood, and the only bishops, priests, and deacons can touch the tabernacles. The origin the of tabernacles is very ancient. In 4-th century many church writes note about a pidgins, which the Eucharist gist is kept in. Since the oriental churches, and churches of East, dissociated much later (in 5-6 cen.) it is allowed to think that they are also kept the ancient tradition to use the tabernacles. Although the Orthodox are, in the traditional Catholic view, schismatic, they do have valid priestly orders, which means they are able to validly consecrate the Eucharist, so I don't see what would be wrong with making the sign of the cross out of respect for the Real Presence of Jesus Christ in the Eucharist in these churches. Not the answer you're looking for? Browse other questions tagged catholicism eastern-orthodox oriental-orthodox sign-of-the-cross or ask your own question.